The following information was found on the Bounder Yahoo Group email forum and it will help those of you that have some an older Bounder that may require repair parts for your Dometic refrigerator. It was submitted by Charles (Chuck) W.
I found out about this too late, but maybe this information will help someone else. A few weeks ago, the upper hinge on my Dometic fridge door broke and the door fell on the floor. I then noticed that the freezer door hinge was also cracked and ready to break. A call to Dometic confirmed that the only fix was to replace the doors. I invested over $300 in new doors. Today I found a post on a "Sportscoach" site that mentions a less expensive route. The following is quotation from that message. "The upper freezer door hinge broke on my Dometic refrigerator. I checked with Camping World and other sources and was told my only solution was to buy a complete door for $150 or so. Not liking this answer I called Dometic. They said that kits are available to repair all of the door hinges and are available through All Seasons RV Appliance Parts & Service in Elkhart, IN. You can reach them at 800-348-7697 or 800-344-0673. The upper and lower hinge repair kit cost $18.95, can be charged to a credit card and shipped anywhere and that they have any piece that you want. Since having this occur I have talked to two others that have paid for a full door ($350 or so) as well as a freezer door. This company is a valuable resource for us to know about. The most common reason for hinge failures is doors that have not been adjusted. 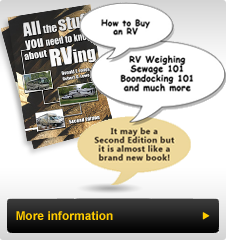 If you refer to Technical Article # 7 on our Website www.rv-partsplus.com you will learn how simple it is to adjust the doors and eliminate the costly replacement mentioned above. "I wish you had said something here first! The plastic hinge pieces often break, usually as a result of the door flying open when we are turning a corner. It is easy to repair and reuse the old hinge as long as you save the pieces. If the door fell off, you will also have to tighten up the metal part that is inside the plastic before repairing the plastic part. Use "JB Weld" to 'glue' it all back together and let harden for a couple of days before putting stress on the hinge. I did this twice on my '91 (different hinges) and never had a failure of a JB Weld repaired hinge, even after years of use. Cost was about $4." As you can see there are a number of solutions to the same problem. Probably the greatest solution to Bounder problems (besides the Technical Tip articles on our website) is the Bounder Yahoo Group email forum and website. This is almost an instant messenger style forum where Bounder interested people post questions, comments, hints etc. and someone usually has a reply. You can search the archives on hundreds of topics and many new Bounder owners decide to buy a Bounder simply because they joined the site and "listened in" before buying. Go to http://groups.yahoo.com/group/bounder for more information.